Can video gamers make money online from home by playing video games? Well, that is what I am going to uncover in this article! Be sure to bookmark this page if you are interested in trying all these methods of making money by playing video games at home. Learn why the video gaming industry is a super, evergreen market where lots of money to be made. Learn why there are lots of money making opportunities for you and how to find them and where to go and what steps to follow. Find out several people who are banking tons of money just doing simple tasks that only takes 1-2 hours per day. Know how to make more than what other people make from 9-5 jobs while doing something that you are really passionate about and enjoy doing it. Learn how to build up a successful business based on online video gaming that will feed you years to come without struggling to find new niches every month and year. Learn why NOT to worry about finding video gaming traffic and places to find them. Here are the 7 excellent ways how you can use video games to make money online. In 2017, there were 2.21 billion gamers worldwide, according to Statista, and that number is expected to reach 2.73 billion by 2021. Esports will also play a role in that growth. Last year, 335 million people watched others play video games competitively, according to industry researcher Newzoo. Believe it or not, companies like EA, Zynga, GameLoft and Microsoft are looking for professional video gamers (like you) to test their upcoming video games. It's also known as video game beta testing. There are basically a few beta testings. Testing new, unreleased video games. Testing new version video games such as Far Cry, Crysis and GTA. Testing new game consoles, controllers. Testing new mobile game versions. According to studies by NewZoo, Video Gaming industry is expected to be worth $180.1Bn by 2021. According to the chart above, Mobile video games are going to take a more significant portion of revenue, and it's not going to end as well. It's growing at 11.0% each year! Why do you care about this information? 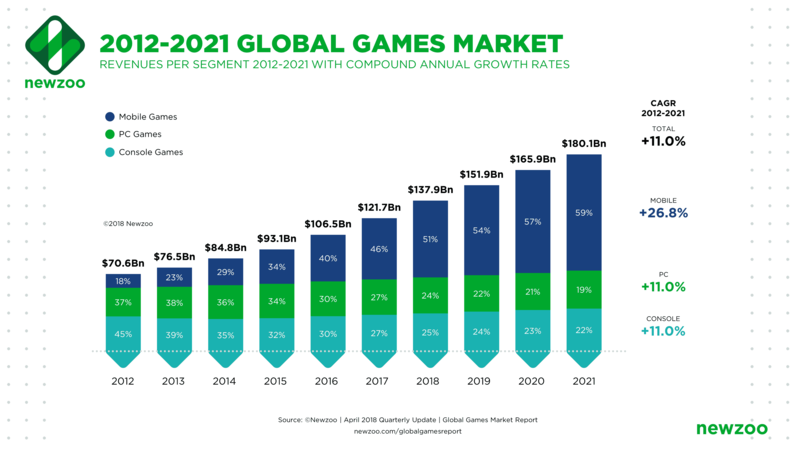 It's because the video gaming industry is not the only evergreen (never dies), but also it is rapidly growing as countries like China, India, Thailand, Taiwan, Philippine, Nigeria are developing. Thereby, millions of young generation tend to play video games, and there are lots of opportunities to make money in video gaming in these new market segments. That is one reason why video game developing companies are focusing on releasing bug-free video games than half-baked, low-quality video games. Because video games are not played for fun and consume time anymore. It has become a fashion, a professional for most people around the world. And thousands of jobs are made around the video gaming industry. Not only that, Video gaming companies want to be in this industry for a long time. They want to make their brand memorable, favorable and the best among other competitors. Those are reasons why new releases of video games such as Far Cry, GTA, Spider-Man are getting higher sales in just first week. (just brand recognizing alone) And not to forget that if the previous game is bug-free and awesome, passionate video gamers not only purchase the newest version, but also recommend to others. To make money by testing video games from home, you need to find a place which recruits new people like. Fortunately, there is one way to become a video game tester without struggling. Follow the steps below to apply for becoming a video game tester. STEP 1: Click here and fill out the form. STEP 3: Invite your friends using the unique URL in the Thank You page to increase your points and take your waiting list up. Use your referral link to invite friends to increase your points. STEP 4: Once you earned points necessary, you will be received an exclusive link to sign up to become a video game tester to your email. STEP 6: Some people make from $500 to $3,000 and $3,500 per month. But, it entirely depends on you. Once the money is earned, you can receive them via PayPal or other online gift card methods such as Amazon Gift card. Invite your close friends via SMS, Messenger, Vyber, WhatsApp and Imo — Text messaging works well for getting referrals quickly. It takes some time and effort from your end to make your first few dollars. But, once you do it right and get familiar with the process, you can make more money by playing video games at home in less time more efficiently. Sign up to become a video game tester here. Some people love to play video games EVERY DAY and test EVERY video game possible they can think of. Some people like playing one type of game (e.g., action & adventure video games, racing video games) and play those games only. In this case, the experience is the key. What if you can share your experience with others and make money? What if you can build a blog (like this) and share your experiences on each game? If you check out the red box at the beginning of the article, you will find out that there were 2.21 billion gaming fans worldwide! In fact, there are only a handful of markets with that amounts of an audience. And compared to other industries such as Ecom and markets such as SEO, affiliate marketing, Video gaming is fairly low competitive, but tremendous opportunities. Here are a few things that you can blog about. There are lots of things to you can talk about video gaming. They aren't limited to the above points. Once you clearly identified on what about to write on (anything related to video gaming), you can start a blog on WordPress. WordPress is the world's most popular blogging platform and the CMS (Content Management System). Websites like Time, Entrepreneur and Mashable are powered by WordPress. Start your WordPress blog on Bluehost for less than $3.95 per month. You will get a free custom domain name when you sign up today. Bluehost is the recommended web hosting for WordPress sites by WordPress.org itself. So, you can trust your site won't be vulnerable. Starting a gaming blog can be yielded in good results when some time goes. Unlike most other money making techniques, when you set up your blog rightly, you will make money from posts created over the years ago. You can start your WordPress blog on Bluehost under 5 minutes. (They provide a free custom domain too). Start your video gaming blog on Bluehost Today! We are in an age where there are YouTube stars. Teenagers are making millions of dollars each year just by uploading videos to YouTube. It's no secret that people are intrigued to video gaming videos on both YouTube and Twitch social networks. That is why there is a separate section for video gamers on YouTube and Twitch are making one of the top 100 most popular websites in the world. Here is how you can make money start a YouTube channel related to video games. In fact, there are YouTube video gaming channels with over one million YouTube subscribers. Think of what you can do with a 1 million highly engaged audience? Send them to your website and promote other stuff such as gaming equipment. Start a giveaway using software like UpViral to grow your followers even more and incentivize them to do tasks such as following you on Instagram and grow your social media channels. Send traffic to CPA (Cost Per Action) offers and earn money for each actions such register for a game, download a video game, etc. Even better, if you go live on YouTube and Twitch, you can make money by playing video games from home through more ways such as donations, comment upgrades, etc. To see how to make money by playing games on YouTube and Twitch, I recommend watching a few videos on popular channels. You will find out that most people make more money by promoting their products. Because they make more money through that! One of best ways to tap into a huge video gaming audience is starting your channels on YouTube and Twitch. Then make your follower base by uploading quality videos and using viral marketing techniques such as starting a giveaway on landmarks like first 1,000 subscribers, 1-year celebration. Once, you have a large following, start monetizing your videos through the methods mentioned above. Since the days of Internet birth, email has got a special place of our lives. Every service uses email as a medium of communication. Look what Facebook uses if you are inactive for too long or someone has sent you a message. How do Amazon and PayPal send you invoices? Heck, even most people check their emails every day. That is a BIG reason why your communication (if you are thinking to run an online business) should be mainly based on. It's okay to build Instagram pages, Twitter accounts, Pinterest pages for your brand. But, you can control them. Your business is depended on their hand. That is another reason why email is better concerning building an audience that matter for your business. And ONE big reason why email is essential for your business is shown in the chart below. According to a study held by Adobe a few years ago, Email marketing gives the best return on investment. It's still true for today as well. Although some things are changed, email still gets high ROI compared to other marketing channels. Here is how you can make money by building your email list. Become an affiliate of video games and promote them through autoresponders. Sell your own PDF guides and courses on playing specific video games. Promote ClickBank affiliates products on video gaming. Making money with an email list is easier when you have an engaged audience. However, it doesn't matter if the email marketing service you use to manage subscribers and send emails is not helpful. If you are getting started and want to sell affiliates products, then use Aweber. It is affiliates-friendly and in this industry for a long time. The secret money making machine for MOST marketers is their email list. It's like their own gold mine. When they need to make some money, they mail a message to the targeted people and see their account's making money. Not many video gaming marketers build an email list. If you want to build a sustainable business that will thrive from days to come, you should make an email list from TODAY! The best email marketing service that you can use that is affiliate-friendly is the Aweber. Click here to sign up for Aweber for free! One of BIGGEST struggles, most vendors or merchants face is finding customers. It is an issue for EVERY seller, right? Thanks for the affiliate marketing model, sellers and people like YOU, both can be beneficial. Let's assume that you used an amazing multiplayer video with your mates. Now you want to introduce it your neighbors and classmates. How about getting a commission when you're promoting the game? That is how affiliate marketing business model is built on. You become an affiliate of a product or service and you are given a commission based on each conversion. There are several pricing models. CPA — Cost Per Action - You will make money when someone completes an action. One of the most popular models particularly in the video game industry. Some CPAs are downloading a video game, achieving a level, an installing video gaming app on their phone. Your affiliate commissions may vary depending on the funnel and commission rates and prices. For example, you may be paid multiple times for each user's activities. Making money by playing video gaming at home isn't hard if you are aware of online marketing. It all falls down to the dedication and your effort into it. For instance, depending on the affiliate program, your earnings and efforts you need to put on may vary. This whole making money video gaming from home as an affiliate marketer can change according to the affiliate network you use too. Here are a few affiliate networks you can find good affiliate products to promote. ClickBank — Best for finding digital marketing products such as courses, eBooks, video guides etc. JvZoo — Best for finding software related affiliate products. ShareASale — Best for finding popular ecom related websites that sell gaming products and tools. Read my ShareASale affiliate network review for more details. You can find hundreds of affiliate products to promote on the above networks. Just make sure to apply for quality products as there are good and bad ones in each one. Promoting gaming products as an affiliate among your close friends is cool. But, it is not viable. You might make several sales. That is it. If you want to earn money as a video game tester from home without bothering your family or friends, you need to find alternatives; find better ways. Here are a few ways how as a video gamer, you can earn money promoting affiliate programs from home. Promote affiliate products through email marketing. Use Aweber for building an email list. Use influencer marketing strategies to promote gaming affiliate products. Follow the above tips to earn money by playing video games at home as an affiliate marketer. Learn building landing pages: Use software like Clickfunnels. Sign up for Clickfunnels 14-free trial over here. Learn copywriting: Copywriting is the key to market your product or service online. Become a good copywriter by following this course. Affiliate marketing can make you more money per month EVEN without you having to worry about customer support and questions etc. As a video game player, you can save more time by being an affiliate marketer, because it's only needed a few hours per week. Many video gamers make real money playing games through affiliate marketing. You can promote gaming products such as consoles, controllers to new video games, gaming app installs etc. and make extra income from home as an affiliate. Smart marketers think forward and use tools like Clickfunnels and Aweber to capture people before sending them to affiliate offer. This not only increases your revenue, but also build an asset that you can make money through it over time. Yes, there are freelance gig opportunities as a video gamer. Check out these Fiverr gigs. This guy from United Kingdom should be making $$$ per week by playing Fortnite from home. Making money with freelancing is not that hard as most people think. But, for sure, there are some works to be done. The best platform to get started on freelancing is Fiverr. Fiverr is newbie friendly. In fact, they support new talents. Once you start making money as a video gamer on Fiverr, you can increase your earnings. Getting first sale is easy on Fiverr. Lots of payout options such as PayPal and Payoneer. Making your first $1 online as a freelancer (or any marketer) is the most challenging thing. Once you cracked the code, you can be unstoppable. Learn how to make your first $1 online on Fiverr. Freelancing video gaming is an easy way to make extra cash by playing games at home. You can offer gigs such as Fortnite training and game play show to make money to play games! If you are just getting started on freelancing, I would recommend using Fiverr first because you can tap into millions of buyers who are searching talents like you! Promote businesses on your Twitch stream. Earn money by making a gaming video or gameplay at home. This freelancer from India provides gaming videos from a wide range of videos that include Fortnite, Far Cry, Crysis, GTA, Assassin Creed. Or make money by providing YouTube shoutouts. If you have a large social media following particularly on networks like Twitch, YouTube, Discord, and Tumblr, you can start providing influencer marketing services. One of the most popular influencer marketing services is shoutouts. There are dedicated websites that provide shoutout services for customers worldwide. Here are services that help influencers to sell ShoutOuts and social media promotions. Becoming an influencer is a bit difficult. But, it's not that harder especially for the video gaming industry as of lots of engaging audiences. Once you have built an engaging audience, you can start making money. If done it rightly, Influencer marketing can make you big money promoting other people's channels and websites on your social accounts. Instagram influencers and YouTube influencers are banking big money these days because of the popularity. Start building your social media following on prefered social networks by using tools like ContentStudio and then start offering shoutout services. When it comes to making money online, there are TWO critical things that EVERY internet marketer should focus on (or want). Traffic — The blood of a business. If you don't have traffic, it doesn't matter how superb your product/service is. No one will buy it. Comparing different methods of driving traffic such as Organic (or SEO or search engines), Paid Advertising such as Google Adwords, Reddit ads, Popup ads, Growth hacking such as viral marketing and email traffic such as solo ads, you can't deny the power of a highly engaged website traffic. Usually, a forum on the gaming niche is getting tons of engagement. For the mere reason of people are very interested in video gaming! Starting a forum for gaming niche or a sub-niche such as car games, mobile games, and fighting games could drive tons of traffic over time. Use banner advertising: Use Google Display ads from Google Adsense to display banner ads on your forum. Use affiliate marketing: Some plugins automatically hyperlink keywords into affiliate links. You can use affiliate programs such as Amazon associates to make more money on the go. Offer paid subscriptions: You can have exclusive content only available for paid members. Use a cart software like ThriveCart to manage subscriptions very smoothly and efficiently. Offer direct advertising opportunities: There are even networks like BuySellAds.com who are specialized in connecting advertisers and publishers. You can go one step further and offer direct advertising opportunities through your site. Run contests/giveaways time to time: Sweepstakes not only can grow your forum or membership site but also make you money. Use a giveaway software like UpViral to run contests and giveaways. Starting a forum might be a difficult task, especially for a video gamer. But, once you created your forum, you can see money comes without you having to do a particular thing. There are lots of free and open source forum software that you can host on your own server to start a forum under your name. Check out these Internet forum software comparisons by Wikipedia for more details. This money making method for gamers is a bit techy. However, if you have a vast experience on video gaming and can handle a forum or membership site, then you should give this a try. You can make money by playing games at home. Depending on the method you have chosen to earn money as a video gamer, the tactics would be different. For example, it does take time to manage a website or forum but doesn't for making money playing games as a video game tester. If you were looking for the best ways to make money playing video games, these 7 ways are widely used, and people are earning money with these methods! Follow one method and start making money on the Internet while being a video gamer. So, what is your best way of making money as a gamer? Enjoyed reading this article? Please share it with your friends.